Editor’s note: The Woodstock Festival, which began on August 15, 1969, and the immense gatherings at Moratorium demonstrations throughout the nation two months later, coalesced people of all ages for the highest civic purpose: peace. Bill Seavey and Bruce Henderson commemorate their experiences at Woodstock. Seavey took the Woodstock crowd photograph. I went to the Woodstock Music Festival, like many others, on a lark. I’d heard about the festival getting organized in upstate New York at the height of the Vietnam War and various protest movements of the ’60s. I was no hippie or radical by any definition; in fact, I was “establishment,” employed as a Newsweek photo intern following graduation from journalism school at Iowa University. Newsweek had let me capture the Apollo 11 astronauts at New York city hall on their return from the first moonwalk, so why not Woodstock? Not newsworthy enough, they said! I went to the concert anyway, and faked a press pass to get in front of the stage and behind a fence that barricaded upwards of 500,000 rabid fans from their musical heroes. After my first night it began to dawn on me that my cameras (I had two) needed to be pointed at not just the entertainers but the those being entertained. And what a scene it was. I began roaming, photographing skinny-dipping youth in a nearby lake, blissed-out revelers, makeshift tepees and tent structures, communal repasts held around open campfires with provisions delivered free from the back of trucks, and, following heavy rains, the muddy remnants of various encampments. This festival photograph—and many other photographs—is the result, never before published. My life after Woodstock went from corporate to communal rather rapidly and in 1972 I ended up in Eugene, Oregon (then known as Berkeley of the North), where I planned to put out the second edition of my 60-page, lavishly illustrated Magazine of Traveling, Living and Being Free (a Budget Travel predecessor, you might say). In Eugene I lived the values Woodstock encouraged and embodied: voluntary simplicity, communalism, cooperation, and tolerance, but I eventually tired of the struggle to be “holier than thou” and returned to California to lead a more conventional life—NOT! What a long, strange trip it’s been. See more of the photographs at Woodstock69Anniversary.com. Bill Seavey has been a Central Coast resident since 1993, residing in Orcutt, Oceano, Arroyo Grande, and now Cambria. He recently published an “economic downturn” survival book (see at thecrisisinvestor.com), and has been a HopeDance volunteer and green-energy consultant. 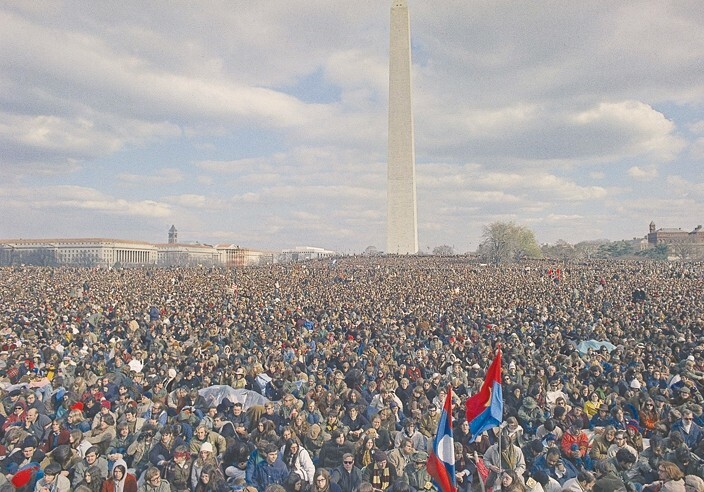 MORATORIUM TO END THE WAR IN VIETNAM:: Washington, D.C., Oct. 15, 1969. My girlfriend and I actually bought tickets and headed up from New Jersey before dawn on Saturday morning. The tickets got us through one roadblock, then we had to abandon our car and walk the last mile. Wet, bedraggled people were leaving. We pressed on to the site, where fences were down. Nobody took tickets or searched for weapons or drugs. We lay down a safe distance from the 100-foot speaker towers and fell asleep. We woke at noon to find ourselves in a sea of people swarming back from the stage over the hill and beyond. The music started, casting its magic spell. 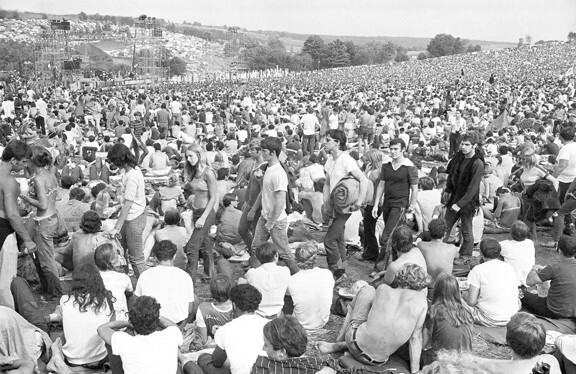 People going had no clue it would turn out to be an historic occasion (we didn’t know it was going to be Woodstock). But it was one of those times when you knew something momentous was happening, sitting in the still eye of the hurricane of change. Bruce Henderson dropped out of college for a year, but eventually earned degrees from Oberlin College, University of Washington, and SUNY Albany. He teaches English and creative writing at Fullerton College and part-time at Cuesta. He has published poetry, a nutrition book, academic essays, and has written an unpublished novel about the 1960s.